Aboriginal communities in Canada are young communities. Thirty percent of the Aboriginal population in Canada is under 15 years of age, a further 18% are between 15 and 24 years. 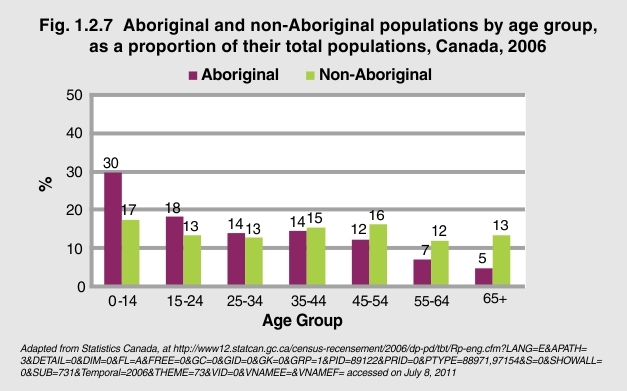 According to population projections released by Statistics Canada in 2005, Aboriginal people could account for a growing share of the young adult population over the next decade. By 2017, Aboriginal people aged 20 to 29 could make up 30% of those in their 20s in Saskatchewan, 24% in Manitoba, 40% in the Yukon Territory and 58% in the Northwest Territories. Already, more than 80% of Nunavut’s population aged 20 to 29 is Aboriginal, and the proportion is expected to grow1. Seniors represent a smaller proportion of the Aboriginal population than the non-Aboriginal population – this is due in part to higher mortality rates and reduced life expectancy in the Aboriginal population.